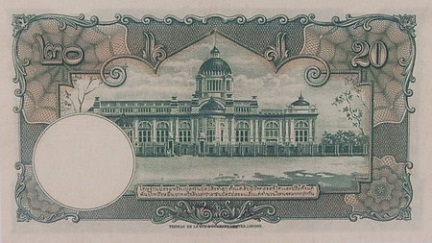 The 20 Baht banknotes have 2 types that were printed from Thomas dela Rue and the Royal Thai Survey Department. 20 Baht Royal Thai Survey new spelling Thai Government and have small text Royal Thai Survey both front and back. Thomas ordinary number signature Pradid VF about 6,600 - 7,000 baht. Royal Thai Survey ordinary number signature Pao UNC about 32,000 -33,500 baht. Royal Thai Survey ordinary number signature Pao EF about 5,900 - 6,200 baht. 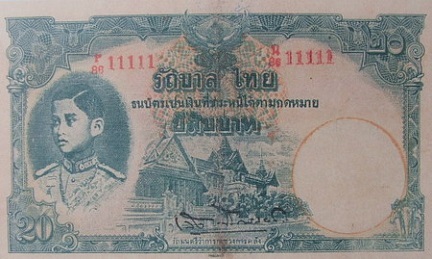 Royal Thai Survey ordinary number signature Leng UNC about 14,200 - 14,900 baht. Royal Thai Survey ordinary number signature Leng EF about 5,400 - 5,700 baht. 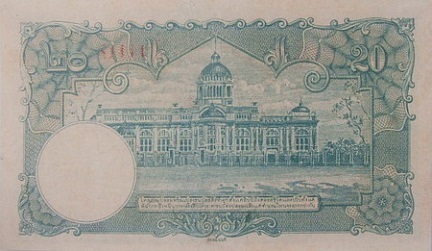 The 4th series 20 Baht Thomas banknotes were announced on 29th December 1939. 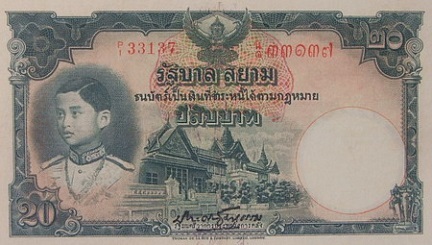 The 4th series 20 Baht Royal Thai Survey banknotes were announced on 17th Febrauary1939. The main object is the image of King Rama 8 on the left. The middle image is the Chakri Maha Prasart Throne Hall. The serial code and number were printed with red ink.